Within the past few decades, major progress has been made in the development of tools to help farmers manage crops with less impact on the environment. 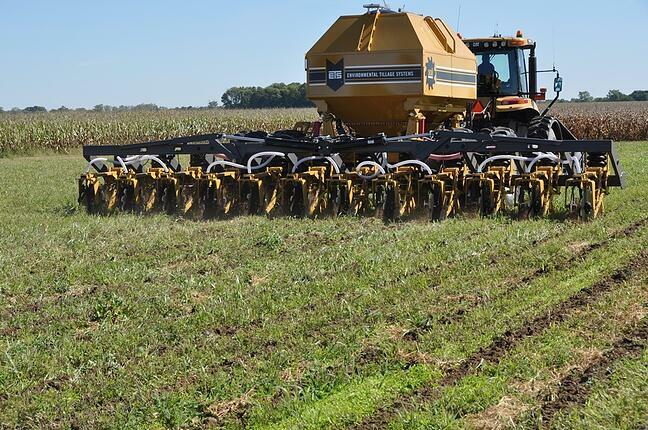 Our SoilWarrior® system is one of these tools, helping farmers reduce their tillage, target nutrient placement, build soil productivity, and increase their profitability through reducing inputs and maintaining yields. The SoilWarrior is a complete strip-till system that uses variable rate technology to place the right amount of fertilizer on each acre. Row units blend and incorporate the fertilizer within a tilled zone for ideal plant uptake. Residue left on the field between rows holds soil in place to reduce erosion, increase water infiltration, and break down to supply the soil with nutrients and build organic matter. The 4R Nutrient Stewardship program is managed and endorsed by the International Plant Nutrition Institute, The Fertilizer Institute, and The Canadian Fertilizer Institute. To learn more about the program, other partners, and resources visit www.nutrientstewardship.com. This includes a pocket guide to 4R Nutrient Stewardship and tips to help growers sustainably maximize their fertilizer usage. ETS manufactures conservation tillage and integrated precision nutrient management equipment in Faribault, MN. Our products set the standard for in-field performance, durability, and ease of operation, while promoting soil productivity. We take pride in providing progressive farmers throughout the world with innovative systems that help them profitably rebuild and revitalize the land.